The aging changes in arterial blood pressure that are observed from conventional blood pressure measurement using the brachial cuff sphygmomanometer are not similar to the changes that occur in central aortic pressure, specifically for systolic and pulse pressure. This is due to the phenomenon of pulse pressure amplification that is largely related to aging changes in arterial stiffness. The most pronounced effect of pulse pressure amplification occurs in the middle age range. 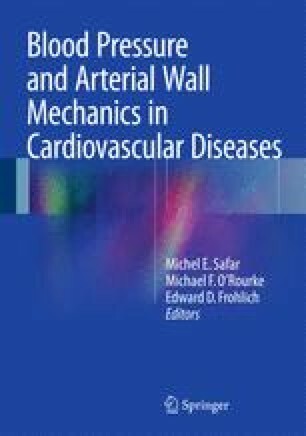 This chapter assesses the underlying concept and perception of what is considered “middle age” and describes the associated age-related changes in arterial stiffness and pulse pressure and evaluates how the changes observed in middle age (in this context defined between 40 and 60 years) can inform the understanding of cardiovascular risk and treatment and management of hypertension in the aging population.